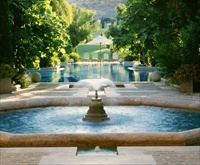 The stylish 5-star Hotel Villa Padierna has an enviable reputation for excellence in service, elegance and luxury. It also has 1131 m2 of impressive conference space, which makes it ideal for events, one of the most exquisite spas in Spain, a championship golf course right on the doorstep, a Roman-style amphitheatre ideal for romantic weddings, outstanding cuisine ... 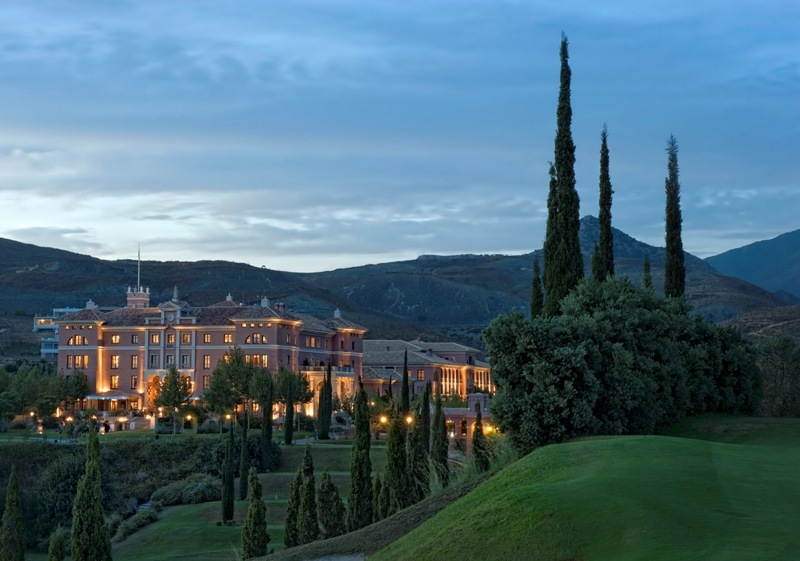 The Hotel Villa Padierna was built in the style of a Tuscan palace in a breathtaking setting. Staying at this very individual 5 star luxury hotel is an experience in itself. Those looking for a beachfront hotel, the Hotel Villa Padierna is approx 3 km from the beach. Multilingual staff, concierge, 24h reception service. In-room safety-deposit box. Laundry and dry cleaning service; iron and ironing board on request. Frette bedlinen, towelling dressing gowns and slippers in all rooms for guest use during stay, evening turndown service, overnight shoe cleaning service gratis. Scales and hairdryer in bathroom. Air conditioning. All rooms have minibar, TV and CD player, high-speed Internet access, and three telephones. 24-hour room service, Nespresso coffee machines in the suites. Babysitting on request. EASTER WEEK GETAWAY: Accommodation for two with complimentary room upgrade (on availability) and welcome gift on arrival; buffet breakfast in the restaurant for two; one thermal spa circuit per person during stay. From 271 euros per room per night. Min stay 2 nights. In the Villa Padierna wing, views of golf course or mountains. 34 m2. Choice of king or twin beds. In the Linares wing, views of golf course or mountains. 40 m2, with balconies or terraces. Choice of king or twin beds. In the Villa Padierna wing, with views of the golf course or mountains. 42 m2. Choice of king or twin beds. In the Villa Padierna and Linares wings, 44 m2 with views of the golf course or mountains. Choice of king or twin beds. Located in the Villa Padierna and Linares wings with views of golf course or mountains. 60 m2 with private balconies or shared terraces in Linares. Choice of king or twin beds. In Villa Padierna wing with view of golf course or mountains. 60m2 with outdoor terrace. Unique boudoir style decor with fabric covered walls and slanted ceilings. Dining table seating five. In Villa Padierna wing, with views of golf course, mountains, pool and gardens, Mediterranean. 64 m2 with 29 m2 outdoor terrace. The Tower Villa lives up to its name: its 355m2 are distributed over three floors. Two pretty bedrooms with ensuite bathrooms; private terraces and solarium, private pool. Living room with fireplace, DVD/CD/MP3 player and LCD flatscreen TVs. Small, fully-equipped kitchen. Two ensuite rooms with five private terraces, one with solarium; private pool; two living rooms with fireplaces and DVD/CD/MP3 player and LCD flatscreen TVs; two small fully equipped kitchens. 383m2. Two en-suite bedrooms with terrace or sundeck; private pool/jacuzzi; living room with fireplace; small fully equipped kitchen. CD/DVD/MP3 player; LCD flat screen TVs. From 265m2. Two pretty rooms with private terrace, two en-suite bedrooms, living room with fireplace, DVD/CD/MP3 player, LCD flatscreen TVs. Small fully-equipped kitchen. 250m2. Two rooms and three terraces with pergola and solarium; two ensuite bedrooms, living room with fireplace, DVD/CD/MP3 player and LCD flatscreen TVs. Fully equipped small kitchen. 202m2. 2 ensuite rooms, living room with fireplace, DVD/CD/ MP3 player and LCD flatscreen TVs. Small fully equipped kitchen. Check-in: guaranteed from 15:00. Check-out: 12:00 midday. Children under 12 may stay free in the parents´ room. Offer available in all rooms except Classic and Superior rooms. Up to 2 children may stay in the Penthouse Suites. Cost of extra bed: USD 150/100 euros. Internet use not included in room rate. The Hotel Villa Padierna accepts the following credit cards: Visa, MasterCard, American Express and Diners Club. Reservations may be cancelled without charge up to 2 days before arrival. In case of cancellation within 2 days of arrival, a charge of 1 night + VAT will be made. La Veranda, formal dining. Creative gourmet Basque/Andalusian fusion cuisine, using seasonal produce. Vegetarian menu, children´s menu. Reservations recommended. Open Tuesday to Saturday 20:00-23:00. Closed 15-30 November. La Loggia, casual dining with great views over the golf course to the sea. Regional Spanish and international cuisine. Children's menu. Open daily for breakfast, lunch and informal dinner from 07:30 to 23:30. Eddy's Bar, traditional English club atmosphere. Smoking permitted. The bar adjoins a stylish country-house sitting-room with an open fireplace. 24 hr room service, children's menu. La Cantina del Golf serves sandwiches, snacks and drinks throughout the day. Clubhouse atmosphere, and great views of the golf course down to the sea. In the Villa Padierna building: SALÓN TOSCANA, capacity 220 persons seated and 400 for a reception. Can be divided into three equal areas. SALÓN VENUS: Ideal for meetings and private dinners for 40-80 people. Imposing room with a fireplace, antique furniture, works of art and terrace. In the Linares building: SALÓN LINARES, a magnificent 566 m2 ballroom with terrace accommodating up to 600, ideal for weddings and gala dinners. Can be divided into two separate rooms. Adjoining bar. FOYER LINARES: 105 m2 with grand staircase, antique sculptures and pictures, a dream background for stylish parties and exhibitions. ROMAN AMPHITHEATRE: Of white marble, surrounded by gardens and fountains, a unique venue seating 400 for musical, theatre or dance events as well as weddings and presentations. Marbella's leading conference venue offers impressive facilities for product launches, meetings and memorable conferences. 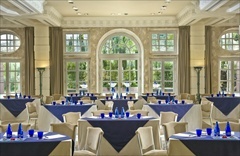 1131 m2 meeting space include 8 function rooms and 5 terraces, including the Roman amphitheatre accommodating up to 400. Extensive amenities and specialised events team capably handle events from 1 day meetings to 1 week gala business events. Advanced audiovisual equipment, technical assistance available for presentations. Business Centre provides key support with high-speed internet access, printing facilities, meeting planner. Luxurious surroundings, impeccable service. IN THE HOTEL: 2 18-HOLE GOLF COURSES: Los Flamingos, par 71 world championship course; Alferini, par 73. Men\'s handicap 26; ladies\' 34. RACQUET CLUB: 6 paddle courts, 2 tennis courts, playground, mini football, bar, restaurant, sports shop, parking. Open daily 10:00-22:30. FITNESS CENTRE: Cardio and muscular training in a great atmosphere, comprehensive selection of appliances. Pilates, aquagym and stretching in the summer. KIDS\' CLUB (seasonal): Well-equipped facilities for kids 4-12. Dancing, singing, comedy sketches with costumes, stories, outdoor games, etc. Qualified supervisor. Full day 10:00-18:00, half day 10:00-14:00 or 14:00-18:00. OUTDOOR POOL in water gardens. OUTSIDE HOTEL: PURO BEACH: Exclusive beach club offering VIP treatment and 20% off beach loungers to Villa Padierna guests. Delightful Roman-style spa with 21st century comfort. Dynamic indoor pool, plunge pool, Turkish bath. Aromatic Thermal Circuit with 8 themed steam and aromatherapy rooms. Orange- and lemon-scented showers, ice shower. Relaxation room where fresh fruit, fruit juices and infusions are provided. Full range of body massages and treatments. Mobile phone use not permitted. Children over 6 and under 12 may use facilities from 13:00-15:00 under supervision, max. 8 children. Reservations essential; charge made for cancellations within 24 hours of appointment. Beauty salon and barber shop: range of hair and beauty services. No smoking in public areas inside the hotel. Pets under 5 kgs are permitted. Charge per night: USD 106 / 70 euros + VAT. The hotel is 10 mins from Estepona, a small town which still keeps the atmosphere of the fishing village it once was; 15 mins from Puerto Banús, famous for its chic shops, nightclubs and world class yacht marina; 20 mins from the old town of Marbella, its Mozarab architecture and fascinating maze of cobbled streets, small shops and bars; and 10 mins from the beach. The Hotel Villa Padierna will arrange private transport from Málaga airport on request, cost from USD 163/108 euros + VAT. Taxis are available at Málaga airport. The 75-minute trip from the airport to the Hotel Villa Padierna costs approximately USD 150/100 euros. Málaga airport has a car hire collection and drop-off point. Reservation recommended. Secure 24-hr parking is available at the Hotel Villa Padierna. Cost is USD 18/12 euros (VAT included) per night, per vehicle. TOWNS: Marbella 24 km/20 min. Puerto Banús 13 km/10 min. Ronda 58 km/45 min. Granada 208 km/2 h. Jerez de la Frontera 152 km/90 min. Sevilla 257 km/2 h 50 min. Cordoba 216 km/2 h 31 min. SHOPPING: El Corte Inglés department store, 10 min. La Cañada shopping mall, 20 min. Marbella old town centre 20 min. SPORTS: In the hotel: fitness. At the hotel and nearby: golf. 10 mins: Riding, tennis. 15 mins: Fishing and sailing, hiking, 4x4, quad, archery, diving, rock climbing, waterskiing, kayaking. 20 mins: Karting. 40 mins: parasailing. 45 mins: diving, kitesurfing, windsurfing, dolphin and whale watching by boat. 1 hr: Ascari Race Resort. 2½ hrs: skiing in the Sierra Nevada. FUN FOR KIDS: 5 mins: Selwo Adventure Park. 35 mins: Selwo Marine Park. 45 mins: Mijas Water Park. For more details, see the Stylish Places to Stay Marbella City Guide and Top 10 Things to do in Andalusia.